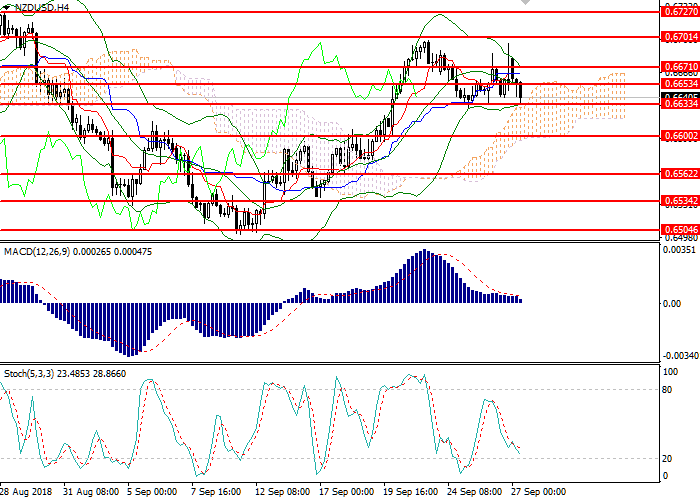 Today, the pair showed a moderate decline against the backdrop of the RBNZ decision on monetary policy. The New Zealand regulator left the interest rate at the level of 1.75% as expected. At the same time, comments on monetary policy were extremely cautious, which disappointed investors. The RBNZ is interested in a low exchange rate of NZD in order to maintain demand for exports. This measure is aimed at mitigating the consequences of the US-China trade conflict. Yesterday, the Fed announced the increase in the interest rate by 25 basis points, which was expected by the market. USD strengthening was limited as a number of financiers saw signs of overheating of the American economy. In this regard, investors are expecting today's speech of the Fed head Powell. Today, a number of significant macroeconomic releases are expected, the publication of which will create volatility in the market. At 14:30 (GMT+2), data on GDP, as well as statistics on personal spending will be published in the US. The speech by the Fed Head Jerome Powell is due at 22:30 (GMT+2). On the H4 chart the instrument is trading in the lower part of Bollinger Bands. The indicator corrected horizontally and the price range reduced, which indicates further downward correction. MACD histogram is consolidating at the zero mark; the signal for entering the market is not formed. Stochastic is approaching the oversold area boundary; a buy signal can be formed during the day. Resistance levels: 0.6653, 0.6671, 0.6701, 0.6727, 0.6753. Support levels: 0.6633, 0.6600, 0.6562, 0.6534, 0.6505. Short positions may be opened below 0.6630 with target at 0.6570 and stop loss at 0.6660. Long positions may be opened above 0.6660 with target at 0.6700 and stop loss at 0.6640.